The US military chief confirmed that he had discussed the possibility of the use of chemical weapons during the invasion of Edebal on the last major settlement of the Syrian rebels in his usual interaction with the White House. The President of the Joint Chief of Staff Joseph Joseph Dunford said that the president has not yet made any decision for any military action in the case of chemical weapons. On the other hand, the Syrian government and Russia have said that they will continue attacking Adilbala under their plan. The Syrian government has expressed it in numerous tweets after talks with the Iranian and Russian leaders. Turkish President Recep Tayyip Erdoğan has said that the world can not find the eyes on this massacre. The United Nations Security Council has been warned that any type of attack can be a resurrection for human life. Russia rejects the demand for Turkey's ceasefire in Edebal, the last strongest rebels of northern Syria, saying that the fight against terrorists will continue. Iran, Russia and Turkey's Presidents on Admiral's military operation attended a high-level meeting in Tehran, in which Turkey's President emphasized that the Syrian government should be put to war in order to avoid blood strain. However, Russian President Vladimir Putin has said that Russia will continue to fight against terrorists in Adult-province. In the meeting Russia and Iran say that the war against terrorism should continue, and Syrian President Bashar al-Assad has the right to get full control of Syria. A few groups of rebels have been supported in Turkey's Syria and fear that in Adalbal, the crisis will bring refugees to its southern border. 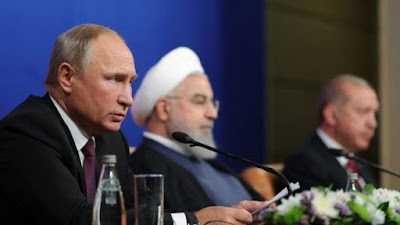 However, Russia and Iran's allies have said that al-Jihadi must endanger all Jihadi groups, whereas Russian President Putin says that Syria's legal government has the right to eventually end all its national Regain control over the areas. If there is a large scale war zone open in expectations under the expectations, there are very serious concerns about severe human crisis. Earlier, the American delegate told Syria that the evidence came to show that the Syrian government is preparing to attack chemicals. Apart from this, reports of fresh air strikes have also been reported on Friday morning on rebel hideouts. Iran, Turkey and Russia have played an important role in Syrian civil war. Turkey, who supports rebels, thinks that a massive problem of refugees on their own southern border will cause massive warfare. Russia and Iran have been supporting the Syrian government so far and they believe that the rebels must be completely defeated. Russian planes have bombarded in the northwestern regions of Syria and Syrian rebels are preparing for this big front. According to news reports, the American delegate, Jim Jefrey, says that the expected front issue is equally unimportant. After assuming this post, Jim Jefrey said in his first interview that we have a very strong license to warn. 'Any action is unusual in our view. There are many evidence that chemical weapons are being prepared. "However, they did not provide any such evidence. US Secretary of State warned Monday that the US government will respond to the use of chemical weapons by the Syrian government or its allies. Despite the Syrian opposition, the UN says that the Syrian government responsible for the chemical attack in 2017 was itself. Jim Jefrey says that this issue requires massive diplomatic efforts. He said that unless the terrorist organization Government Islami is defeated and the Iranian warriors do not leave Syria, President Donald Trump is committed to joining Syria. He said that President Bashar al-Assad has no future rulership in Syria, but removing them is not a US job. He said that the United States is willing to work on a political transition with Russia. It is believed that there are 30000 jihadists and warlords in the synagogues. According to the United Nations, there are 29 million people living in Idlib, which have 10 million children. According to the UN, at least eight million people will be displaced by this attack, and due to this, dramatic increase in the number of people already entitled to aid. Remember that almost half of the Syrian population has been compelled to migrate at least once.